Star Wars is one of the biggest movie franchises of our time and the space ships have people talking long after the credits roll. If you have always wondered what it would take to fly one of the space ships, you are in luck. Air Hogs has unveiled the millennium falcon drone, a perfect drone for all ages and not just children. 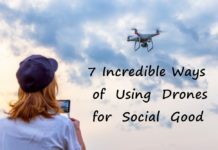 The drone is unlike anything you have seen with other commercial drones, and it will leave you giddy. 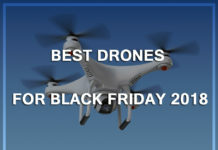 The company has been on a run producing very interestingly designed drones. The best thing is that you can find the Air Hogs millennium falcon drone for sale on various online platforms including Amazon. However, before you go and get yourself the remote controlled millennium falcon drone it is important that you read on to the end for an unbiased Star Wars Millennium falcon drone review. 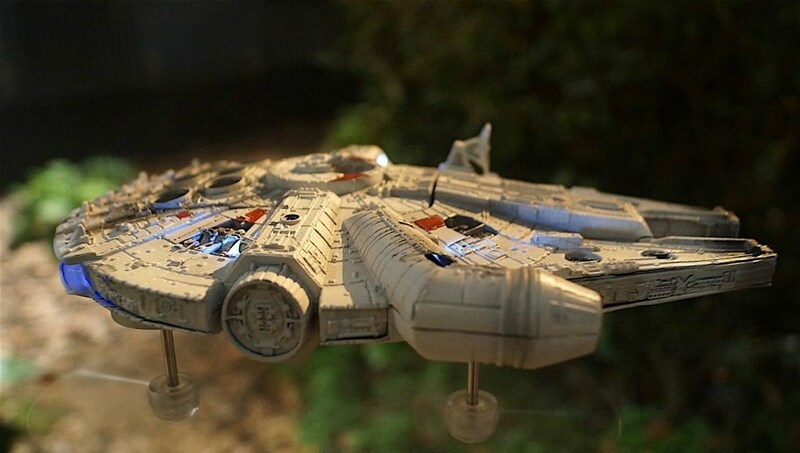 It is not a perfect replica of the actual millennium falcon, but there are reasons why you worth it. Depending on your needs, you will find that the Air Hogs millennium falcon drone will feed your rare drone flying appetite. One of the things that makes this drone stand out is the design. It is arguably the best representation of the actual spaceship. However, it is not an exact replica of Kessel Run’s ship since it is missing certain details including the communication antenna. In spite of this, it was not possible to create an exact replica of the millennium falcon ship. The main difference you will note in the design are the four slots that house the motors and propellers. It is not an aerodynamic drone and Air Hogs recommends that it be flown indoors since it cannot handle the wind speeds of open spaces. The body is made from crush resistant foam and this works to protect the propellers and the motors. The high-quality multitone latex paint on the body of the millennium falcon drone is close to the actual millennium falcon in the film. 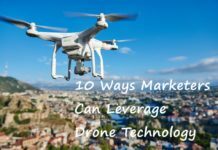 You do not get some of the major features you would expect in most drones such as headless mode, app control, FPV, or a camera. However, the millennium falcon drone is impressive with the many whistles and bells. The inner compartment that holds the electronics, the propeller holders is made from hardened plastic. 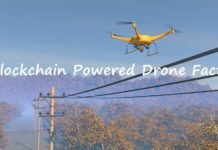 Here is an overview of the features and specifications you can expect from the Air Hogs millennium falcon drone to look out for when it is posted for sale. You get special features including the millennium falcon design, LED lights, impact resistant foam body, and cool sound effects. However, with its lack of key features such as GPS, a camera, VR, and no way to replace the battery, it is proving to be a hard sale. I bet you are asking why you worth it, well it is more like a collector’s drone and for beginners to practice their flying. 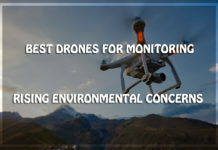 By now, most drone enthusiasts usually have given up on the Air Hogs millennium falcon drone, but there are several reasons why you ought to add it to cart when it is put up for sale. No matter how careful you are at drone flying, there will come a tome when you will crush. This could be because of a power failure, or strong winds. However, the one of the reasons you should buy it is the impact resistance foam body. The foam is very durable and it is covered with rubber and this makes it ready to fly no matter the number of crushes. This means that you will have as much fun as you want without fear that you will need replacement parts. With that said, the remote controlled millennium falcon drone is not rigid and it is bendy. 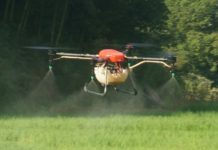 The Air Hogs millennium falcon drone in its attempt to elicit the feeling of flying a Star Wars ship has included a similar design to that of the actual millennium falcon space ship. The millennium falcon drone design is sure to be a conversation starter. Above this, you get a dedicated button on the transmitter that plays iconic Star Wars sound effects. 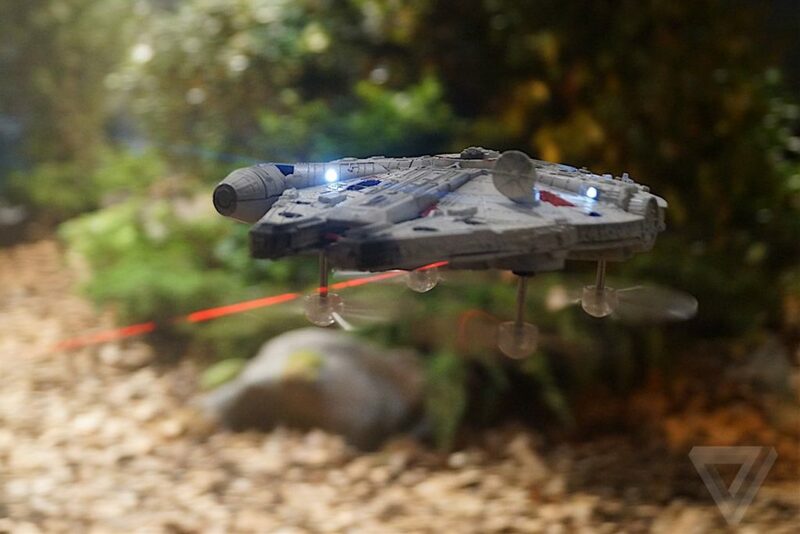 The remote controlled millennium falcon drone has LED lights at the front and at the back. When the lights come on, it gives the notion that the drone is in hyperdrive. The transmitter is very responsive to the drone and there is minimal delay before the drone responds to the commands. The sound effects range from laser beams firing, R2-D2 beeps, and the sound the millennium falcon makes when it goes into hyperdrive, just to name a few of the dozen sound effects. The millennial falcon drone has an ergonomic physical transmitter and it is equally interesting as the drone itself. The transmitter uses 6 1.5V AA batteries and it has a range of 60 meters which is equivalent to 200 feet. The design of the transmitter makes it very good to hold, and it has a Star Wars logo on the face. It also has two joy sticks, a power button, a status LED with a lightning bolt. The right joy stick controls the roll and pitch while the left joy stick controls the yaw and the throttle. It has an inbuilt speaker and a volume slide housed below the Star Wars logo. To play the cool Star Wars, push the left trigger on the front of the transmitter. The right trigger button triggers the hyperdrive function. The transmitter needs 6 batteries for the many features it has including the playing of the sound effects. Besides this the transmitter also charges the millennium falcon drone. 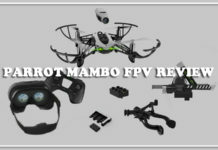 Air Hogs has included a latch on the right-hand grip of the transmitter where you attach the charging cable that then directly plugs into the drone’s underside. The charging cable plugs into the transmitter through a USB port. The cable is stored in the transmitter for your convenience. You will need a screwdriver to access the battery compartment on the transmitter. When flying, the transmitter connects to the millennium falcon drone via a 2.4 GHz Wi-Fi connection. The remote controlled millennium falcon drone uses a similar battery like all other drones under the Air Hogs brand. 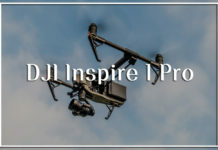 When fully charged, the 140 mAh Li-Po battery gives the drone between 5 and 6 minutes of flight time and it takes between 40 minutes to an hour to fully charge it. The battery is soldered into the drone and there is no way of replacing it unless you take the foam casing apart. 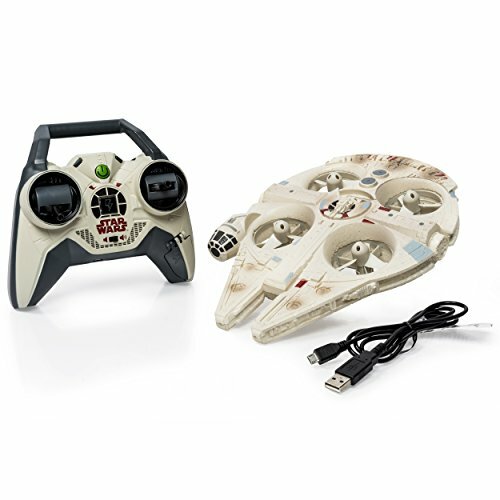 Since the cable is the typical USB, it is wise to save your transmitter batteries and charge the Air Hogs Millennium falcon drone using a computer or a power brick. When the millennium falcon drone is fully charged, you will see a red light blinking and you are set to go flying like a true space warrior. 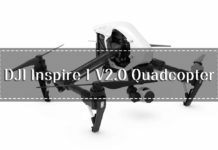 The battery life is the shortest you will see on a drone, but t makes up by having a better than average flying experience. The fact that you get only 5 minutes of flight time after charging the Air Hogs millennium falcon drone for an hour is impractical. However, for those 5 minutes, you will get a very fun flying experience indoors. The controls on the other hand as not as precise or responsive and this makes it not fun at all when flying outdoors. In spite of this, the remote controlled millennium falcon drone is fun and easy to fly in tight spaces indoors. 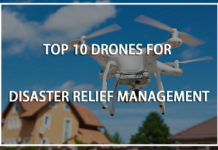 The foam and rubber body of the drone makes it convenient to bump into walls and other objects and keep flying. However, since it is next to impossible to restrict to fling indoors, you could take some precautions. First, ensure that there are is no wind at all. Various videos and websites have shown the Air Hogs millennium falcon drone being swept away by even the slightest breeze. However, you can fly low near the ground, otherwise, you will be collecting your millennium flacon drone on the roof or tree. 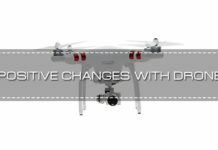 The remote controlled millennium drone only has one flight mode; low-speed indoor flight. However, when you hit the hyperdrive button, you are able to get much faster speeds. There are no pre-programmed stunts other than the lights, sound effects and the fast speed when you hit the hyperdrive button. With a range of 60 meters, it will be difficult to know which direction the millennium falcon drone is flying especially during the day. However, at night, the LED lights will show you which is the way to go. 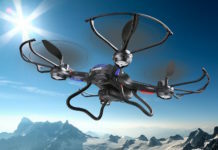 If you have flown other drones, then you know the danger of getting your fingers caught between the propeller blades. The remote controlled millennium falcon drone has the rotor blades shielded for your safety. If you treat it gently, the drone will keep a straight course perfectly, as well as banking, hovering, and spinning just like in the Star Wars movie. While a Star Wars fan will love the remote controlled millennium falcon drone, Air Hogs could have done a better job before putting up for sale. 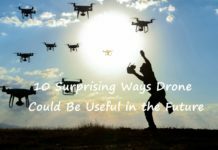 With the missing features, it will feel different flying the drone. Here are the things that should have gone into the Air Hogs Millennium falcon drone. Looking at the fact that a camera is one of the crucial parts of a drone, the lack of it in the millennium falcon drone reduces its functionality. 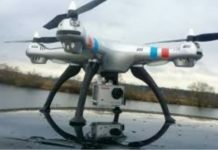 The drone has several places that the camera could have been mounted or built it. Since there are is no landing gear to keep up the image of the actual millennium falcon, it could have used with VR capabilities with the use of FPV googles. While there is not battery that can fly for hours as we would want, the Air Hogs millennium falcon drone has a non-replaceable battery. The worst bit is that it an hour of charging gives it a mere 5 minutes of flight time. 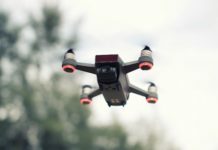 Air Hogs has continually produced drones with non-replaceable batteries and this makes it less fun to fly because the juice will run out very fast without the option of replacing it with a charged battery. The millennium flacon drone lacks in several features you would expect from a commercial drone put up for sale. It lacks the return to home feature, altitude hold, GPS, and autonomous flight modes. 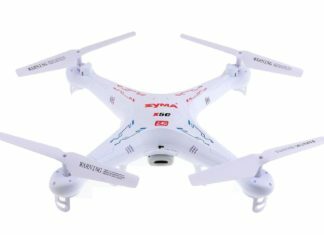 With the lack of the RTH feature, you will have to follow the drone if you are racing, or maneuver it to land back to your position. 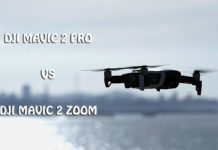 Compared to other drones in the Air Hogs millennium falcon drone price range, it feels that they are asking us to pay too much. It is for sale on Amazon, Walmart, eBay, and other sites so where you choose to buy it is a matter of preference. Walmart has the best price at $65 while other places charge over $85 and you will find sites pricing it at over $100. If you still want the millennium falcon drone, you will have to do your research and find the best price for your budget. 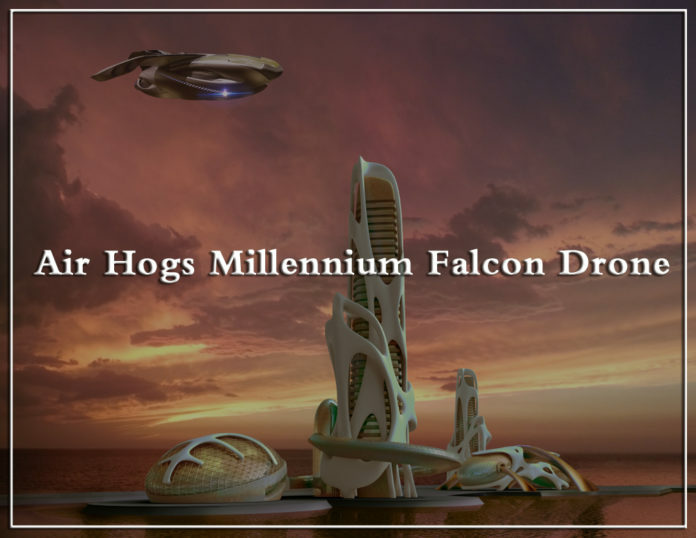 The Air Hog millennium falcon drone is not only perfect for children but for people of all ages, especially those with a knack for Star Wars memorabilia. The sound effects and the LED lights as well as the ergonomic transmitter give the remote controlled millennium falcon drone an allure you do not get from many drone. 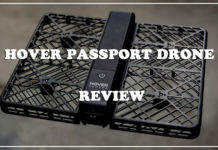 It is a durable drone and you will still get good functionality after several bumps and crashes. 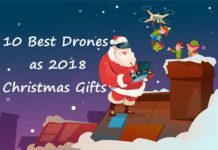 It is a perfect gift for a Star Wars fan, but if you are not, you will not enjoy it as much as you would other commercial drones for sale with a similar price tag. 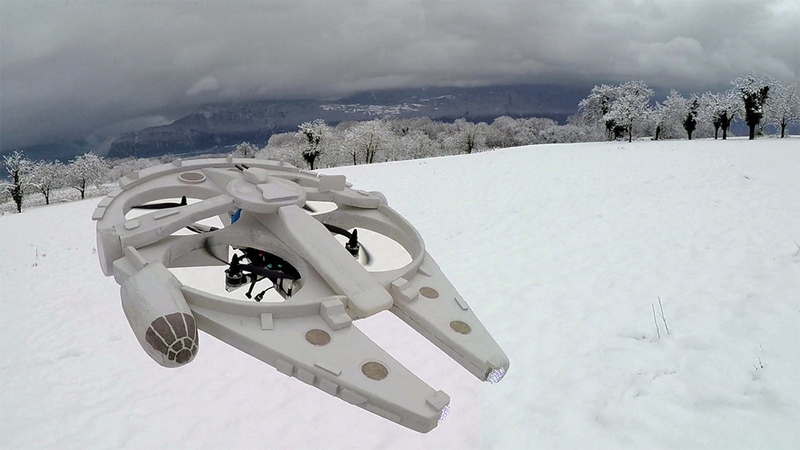 Do you have the Air Hogs millennium falcon drone? Share your experience with us in the comment section below.